Recent news reports have suggested that the hard line taken by Tea Party and other conservative Republicans in the House in the budget and debt ceiling battles may be producing a backlash among party supporters and donors who are concerned about the political impact of the government shutdown and a possible U.S. default on its debt. But to whatever extent that pushback may be happening, it’s a point of view not shared by rank-and-file Republicans. Just 18% of Republicans believed their leaders were paying too much attention to the Tea Party, up slightly from 13% two years ago, according to a Pew Research Center survey conducted last week. Most Republicans said the party’s leaders were either paying the right amount (40%) or too little (24%) attention to the positions of the Tea Party. Even among Republicans and Republican leaners who do not agree with the Tea Party movement, more than half said either that the GOP was paying the right amount of attention (34%) to the ideas of the Tea Party or too little (21%). 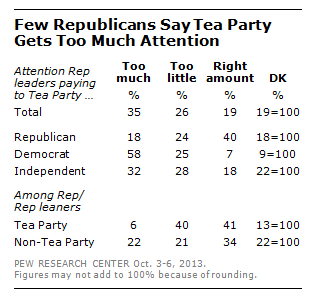 Just 22% of non-Tea Party Republicans said the movement receives too much attention from the Republican Party. Another aspect to the political forces at work is the views of Republicans who most frequently vote in primaries. An analysis of a September Pew Research poll found that among Republicans and Republican-leaning registered voters who say they always vote in primary elections, 53% said they wanted lawmakers to do what they could to make the health care law fail, which has been a goal of the Tea Party bloc in the House. Just 32% said lawmakers should instead try to make the law work as well as they can. In addition, about four-in-10 of GOP primary voters also say Republicans in Congress have compromised too much with Democrats compared to 22% who say they have not compromised enough. When it comes to the general public, a minority (35%) of those surveyed said Republican leaders were paying too much attention to the Tea party. Read more.